This User Agreement (Agreement) governs the use of the Grow Strategy Pty Ltd (GROW|STRATEGY) application and services and its website and is legally binding between GROW|STRATEGY (We, Us or Our) and You (You, Your or Yourself). By clicking “I agree” or accessing and using Our application, services and website, You acknowledge and agree that You have read and understood the Agreement and agree to be bound by its terms and that if You are using GROW|STRATEGY on behalf of an entity other than Yourself, You have the power and authority to bind that entity and consent to the Agreement. Fees means the Subscription Fee, any one-time fees, the Renewal Term Subscription Fee and any additional fees that You pay Us under this Agreement. First Term means the initial period of this Agreement. First Term Subscription Fee means the fees owed by You and specified in the Order for the license to use the Services and Software for the First Term. Member means third parties who are also using GROW|STRATEGY and who may participate in Member forums set up by Us that permit Members to share their information and experiences using the Services. Moral Rights has the same meaning as the term has in Part IX of the Copyright Act 1968 (Cth). Order means Your purchase of a license via Our Website for the Services and use of the Software during a Term. Our Confidential Information means all trade secrets, ideas, know how, concepts and information whether in writing or otherwise relating in any way to Us, Our sub-licensees, agents and employees, Our affairs or businesses, sales, marketing or promotional information, this Agreement including any such information in Our power, possession or control concerning or belonging to any third party but does not include information that: (a) is, or becomes part of, the public domain otherwise than by breach of this Agreement by You or Us; (b) is lawfully obtained by either party from another person without any restriction as to use and disclosure; or (c) was in the receiving party’s possession prior to disclosure to it by You or Us. Our Intellectual Property Rights means copyright, and all rights in relation to inventions, registered and unregistered trade marks (including service marks), registered and unregistered designs, circuit layouts, and any other rights resulting from intellectual activity in the industrial, scientific, literary or artistic fields under the laws of any jurisdiction throughout the world and includes data and usage statistics that We collect from Users of the Services and the Software but excludes Your Confidential Information. Renewal Term Subscription Fee means the fees owed by You to us to extend the license and this Agreement for the Renewal Term. Services means the GROW|STRATEGY platform and its content and Our consulting and support services, which are designed to help You grow Your business, and any related services and offerings that are the subject of this Agreement or made available to You by Us. Software means any software product that We make available to You from Our Website and includes any updates, upgrades, modifications and documentation that We provide to You for the Software. Support Plan means the plan for technical support available from Our Website and as updated from time to time. Supported Device means a computer or other device that meets the specifications described on the Website and that We support for the operation of the Software and the provision of the Services. Website means the GROW|STRATEGY website or the website of a partner of Ours who may be linked to Our website or authorised to distribute Our Services and Software. Your Confidential Information means Your business plan that You develop as a result of using the Services that contains personal and identifiable information about Your business, including Your sales and marketing programs and information but does not include information that: (a) is, or becomes part of, the public domain otherwise than by breach of this Agreement by Us; (b) is lawfully obtained by either party from another person without any restriction as to use and disclosure; or (c) was in the receiving party’s possession prior to disclosure to it by You. GRANT OF LICENSE. We grant You a non-exclusive, non-transferable, limited licence to use Our Services and use the Software on a Supported Device for the Term specified in the Order. You may only use the Services and Software for the number of Users specified in the Order. This license does not allow You to use the Software to operate a service bureau, SaaS, hosting service or other similar service. Neither this Agreement nor the Services or the Software may be sold, leased, assigned, sublicensed or transferred by You, in whole or in part. SCOPE OF USE. You may only use the Services and Software for Your internal business purposes and You may not modify, alter or adapt the Services or the Software or merge all or part of the Software with any other Software without Our prior written consent. You may not reverse engineer, reverse compile or decompile the Services or the Software or try to access or discover its source code or any trade secret related to the Services or Software. You may not remove or obscure any notice relating to Our Intellectual Property Rights. You must immediately notify us if You become aware of any unauthorised use of the Services or the Software. You acknowledge that We may incorporate technical features into the Software to enforce this Agreement. FEES. You agree to pay the Initial Term Subscription Fee as specified in the Order. You must pay a Renewal Term Subscription Fee to use the Services and Software for a Renewal Term. We may increase the Fees at any time to reflect changes in Our standard rates and charges. Unless stated otherwise, Our Fees are exclusive of all goods and services tax (GST), sales, use, value-added and other taxes and duties other than tax owed on Our net income. SUPPORT. If You have paid the First Term Subscription Fee and any Renewal Term Subscription Fee for the relevant Term, We will provide technical consultation on the Software in accordance with the Support Plan. Pursuant to Our Support Plan, We offer support services through the Website or via email as specified on the Website. For an additional fee as stated in the Support Plan, You may receive direct assistance from Us by telephone. YOUR USE OF THE SERVICES. 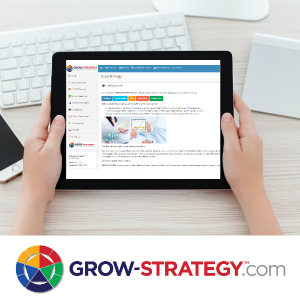 You agree to use GROW|STRATEGY and the Services for their intended purpose and that You acknowledge and agree that information may be shared amongst the Member community. If You participate in a Member community forum or post information on a blog, You agree not to disparage or defame other Members or make or publish any remarks that insult or cause injury to another Member. You agree that We may make use of Your comments on community forums and blogs. CONFIDENTIAL INFORMATION. We and You agree not to disclose, duplicate or otherwise reproduce, directly or indirectly, each other’s Confidential Information in whole or in part. We and You further agree to use each other’s Confidential Information solely for the purposes of exercising each other’s rights stated under this Agreement or other rights that are clearly contemplated by this Agreement. LIMITED WARRANTY. We warrant that for a period of 30 days from when You start using the Services and Software, We will use reasonable commercial efforts to correct reproducible problems in the Services and fix reproducible errors in the Software. We do not warrant that Your use of the Services will provide You with the results that You desire or that our information or advice is suitable for Your business. Our entire liability under this warranty and is in lieu of all other warranties, express, statutory, and implied, including, but not limited to, the implied warranties of accuracy, quiet enjoyment, non-infringement, merchantability and fitness for a particular purpose. The warranties set forth in this Clause 9 are expressly subject to the limitation of liability in Clause 10 and apply to You only and not to any third party. LIMITATION OF LIABILITY. We are not responsible for and We specifically disclaim all liability for any loss, liability, damage (whether direct, indirect or consequential, including loss of profit or revenue, loss of anticipated savings, loss of chance, loss of opportunity and loss of reputation), personal injury or expense of any nature whatsoever which may be suffered by You or any third party that may be attributable, directly or indirectly, to Your use of the Services, Software or the Website. We are not liable for any loss or damage that may arise in connection with Your use of the Services and any advice that We may provide to You. If We are found to be liable to You, then Our loss and damage is limited to the amount of fees that We received in relation to the Services under which loss and damage arose. 11. AUSTRALIAN CONSUMER LAW. Under the Australian Consumer Law included in the Competition and Consumer Act 2010 (Cth) (ACL), consumers have certain rights which cannot be excluded, including guarantees as to the fitness for purpose of goods or services. Nothing in this Agreement will be read or applied so as to exclude, restrict or modify or have the effect of excluding, restricting or modifying any condition, warranty, guarantee, right or remedy implied by law (including the ACL) and which by law cannot be excluded, restricted or modified. This Agreement must be read subject to these statutory provisions. Subject to any consumer rights under the ACL and to the extent permitted by law, We limit Our liability in respect of any claim under those provisions, at Our option, to supplying the services again; or paying the cost of having the services supplied again. TERMINATION. We may terminate this Agreement immediately by notice to You if You breach a provision of this Agreement and fail to remedy the breach within 14 days. Either party may terminate this Agreement if the other party becomes or threatens to become subject to any form of bankruptcy or insolvency administration. Upon termination, You are no longer permitted to use the Services or to access the Software You must immediately cease to us it. Termination of this Agreement does not prejudice any rights or any claim that either party may have accrued against the other party up to the date of termination. On termination of this Agreement, You may not use the Software or receive our Services. We may keep a copy of Your Confidential Information for compliance and regulatory purposes and We are not required to purge Your Confidential Information from our electronic archives and backups. GOVERNING LAW. This Agreement and Your use of the Services, Software and Website are governed by the laws of New South Wales and You and We submit to the non-exclusive jurisdiction of the courts of New South Wales and courts entitled to hear appeals from those courts. This Agreement contains the entire agreement and understanding between You and Us about the Software and all prior agreements and representations made between You and Us are superseded by this Agreement. EXPORT. You represent and warrant that the Services and the Software will not be downloaded or used in, or transported to, a country that is subject to an Australian government embargo, or has been designated by the Australian Government as a “terrorist-supporting” country. You must not export or re-export, or permit exportation or re-exportation of the Software in violation of any export provisions of Australia or any other applicable law. 15. GENERAL PROVISIONS. A. Relationship — This Agreement — does not create any partnership, joint venture or agency relationship between You and Us. B. No Authority — Neither We nor You may enter into any agreements or incur any liabilities on behalf of the other party without the other party’s prior written consent nor may represent to any person that it has any authority to do so. C. Publicity — Neither We nor You will make any public announcement or make any representation to any media representative about or concerning: (i) this Agreement; (ii) the performance of this Agreement by any party; (iii) any matter related to this Agreement; or (iv) the other party, without the other party’s prior written consent. D. Waiver — No right under this Agreement is waived or deemed to be waived except by notice in writing signed by the party waiving the right. E. Assignment — We may assign Our rights under this Agreement without Your consent. You may not assign Your rights without Our consent.